Anchor Hocking 8pc Glass Bowl With Lids Set Just $5.99! PLUS FREE Shipping! You are here: Home / Great Deals / Anchor Hocking 8pc Glass Bowl With Lids Set Just $5.99! PLUS FREE Shipping! I have some of these and I LOVE them! We use them every day for sure. 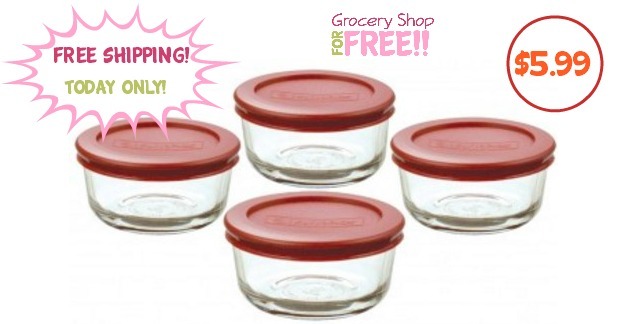 You can get these Anchor Hocking 8pc Glass Kitchen Storage Set With Red Lids for just $5.99 PLUS FREE Shipping! Today Only! I have plastic storage containers I use, too, but, I prefer the glass ones. They are heavy and easily cleaned and they can go in the fridge, freezer, oven, and microwave – so they are much more versatile than plastic containers. A healthy alternative to plastic, glass food storage is non-toxic, dishwasher, microwave, & freezer safe. It’s the perfect choice for storing, reheating, and transporting food!